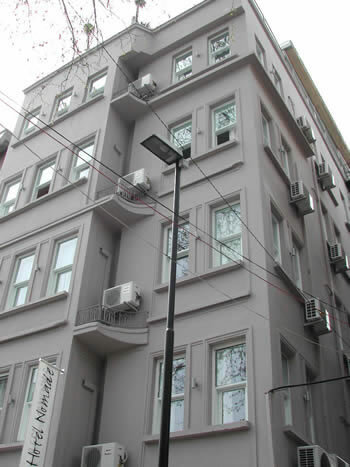 NOMADE HOTEL ,ISTANBUL - SultanahmetNomade Hotel in Istanbul , Nomade Hotel in Sultanahmet , Sultanahmet Hotels , Hotels in Sultanahmet ,estambul ,istamboul,istanbul,istambul,turkiye,turkey,turchia,turquia,turkei, turquie,estambul ,istamboul,istanbul,istambul,turkiye,turkey,turchia,turquia,turkei,turquie,Nomade Hotel in Istanbul , Nomade Hotel in Sultanahmet , Sultanahmet Hotels Hotels in Sultanahmet ,estambul ,istamboul,istanbul,istambul,turkiye,turkey,turchia,turquia,turkei,turquie, estambul ,istamboul,istanbul,istambul,turkiye,turkey,turchiaHome Hotels in Istanbul,Hotels in Turkey,Tours in Istanbul ,Tours in Turkey,Rent A Flat,Rent A Car Istanbul Life ORG Services,Contact Us Hotel Nomade Istanbul Sultanahmet lies in the heart of Istanbul's old city. This delightful inn owned and run by two sisters continues its own tradition; it has recently moved up the street from its former site of 10 years. Close to practically everywhere worth visiting in the old city, Hotel Nomade Istanbul Sultanahmet combines unpretentious hospitality with the buzz of interesting people of all nationalities. Hotel Nomade Istanbul Sultanahmet new building is a renovated old Turkish house with an excellent terrace view to neighboring sites such as St. Sophie, Blue Mosque, and Topkapi Palace - to name a few. Hotel Nomade Istanbul Sultanahmet the rooms leave little to be desired for the fastidious and are charmingly decorated. Hotel Nomade Istanbul Sultanahmet perfect French and English is spoken here. And the best little neighborhood cafe, a restored Byzantine cellar, is just across the street. ''Une adresse chaleuruse...'' Le Guide du Routard, Paris. ''The service is personal, the beds are comfortable and the prices low...'' Fodor's, New York. ''...friendly Hotel Nomade Istanbul is a good place for single women travellers...'' Lonely Planet.Bed & Breakfast and Taxes Included... Nomade Hotel in Istanbul , Nomade Hotel in Sultanahmet , Sultanahmet Hotels , Hotels in Sultanahmet , estambul ,istamboul,istanbul,istambul,turkiye,turkey,turchia,turquia,turkei, turquie, estambul ,istamboul,istanbul,istambul,turkiye,turkey,turchia,turquia,turkei,turquie,Nomade Hotel in Istanbul , Nomade Hotel in Sultanahmet , Sultanahmet Hotels Hotels in Sultanahmet , estambul ,istamboul,istanbul,istambul,turkiye,turkey,turchia,turquia,turkei,turquie, estambul ,istamboul,istanbul,istambul,turkiye,turkey,turchiaHome Hotels in Istanbul,Hotels in Turkey,Tours in Istanbul ,Tours in Turkey,Rent A Flat,Rent A Car Istanbul Life ORG Services,Contact Us Istanbul Life.Org: Incili Cavus Sok.No:37/3 Alemdar Mah. SultanAhmet Istanbul /TURKEYTel: 90 (212) 511 75 56 Fax: 90 (212) 520 77 43 e-mail: info@istanbullife.org,NOMADE HOTEL SULTANAHMET ISTANBUL,nomade hotel in istanbul ,istanbul hotels,istanbuls hotels,hotels in istanbul,nomade,nomade hotel istanbul hotels,hotels in istanbul,nomade hotel in istanbul,istanbul hotels,nomade hotel,NOMADE HOTEL SULTANAHMET ISTANBUL,Hotel Nomade Istanbul Sultanahmet lies in the heart of Istanbul's old city. This delightful inn owned and run by two sisters continues its own tradition; it has recently moved up the street from its former site of 10 years. Close to practically verywhere worth visiting in the old city, Hotel Nomade Istanbul Sultanahmet combines unpretentious hospitality with the buzz of interesting people of all nationalities.Hotel Nomade Istanbul Sultanahmet new building is a renovated old Turkish house with an excellent terrace view to neighboring sites such as St. Sophie, Blue Mosque, and Topkapi Palace - to name a few. Hotel Nomade Istanbul Sultanahmet the rooms leave little to be desired for the fastidious and are charmingly decorated. Hotel Nomade Istanbul Sultanahmet perfect French and English is spoken here. And the best little neighborhood cafe, a restored Byzantine cellar, is just across the street. 'Une adresse chaleuruse...'' Le Guide du Routard, Paris. 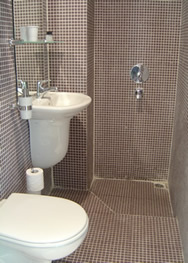 ''The service is personal, the beds are comfortable and the prices low...'' Fodor's, New York. ''...friendly Hotel Nomade Istanbul is a good place for single women travellers...'' Lonely Planet.,Hotel Nomade Istanbul Sultanahmet lies in the heart of Istanbul's old city. This delightful inn owned and run by two sisters continues its own tradition; it has recently moved up the street from its former site of 10 years. Close to practically verywhere worth visiting in the old city, Hotel Nomade Istanbul Sultanahmet combines unpretentious hospitality with the buzz of interesting people of all nationalities.Hotel Nomade Istanbul Sultanahmet new building is a renovated old Turkish house with an excellent terrace view to neighboring sites such as St. Sophie, Blue Mosque, and Topkapi Palace - to name a few. Hotel Nomade Istanbul Sultanahmet the rooms leave little to be desired for the fastidious and are charmingly decorated. Hotel Nomade Istanbul Sultanahmet perfect French and English is spoken here. And the best little neighborhood cafe, a restored Byzantine cellar, is just across the street. 'Une adresse chaleuruse...'' Le Guide du Routard, Paris. ''The service is personal, the beds are comfortable and the prices low...'' Fodor's, New York. 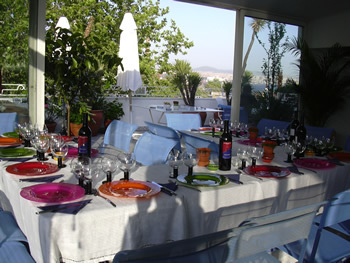 ''...friendly Hotel Nomade Istanbul is a good place for single women travellers...'' Lonely Planet. Hotel Nomade Istanbul Sultanahmet combines unpretentious hospitality with the buzz of interesting people of all nationalities. Hotel Nomade Istanbul Sultanahmet new building is a renovated old Turkish house with an excellent terrace view to neighboring sites such as St. Sophie, Blue Mosque, and Topkapi Palace - to name a few. 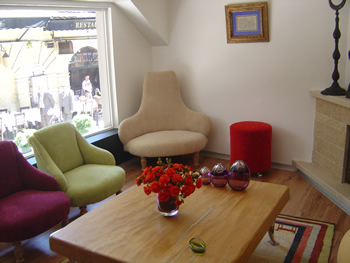 Hotel Nomade Istanbul Sultanahmet the rooms leave little to be desired for the fastidious and are charmingly decorated. Hotel Nomade Istanbul Sultanahmet perfect French and English is spoken here. And the best little neighborhood cafe, a restored Byzantine cellar, is just across the street. ''Une adresse chaleuruse...'' Le Guide du Routard, Paris. 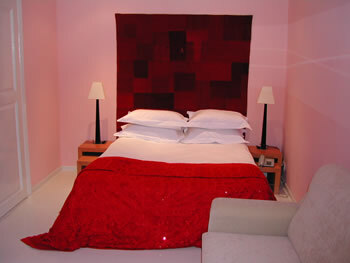 ''The service is personal, the beds are comfortable and the prices low...'' Fodor's, New York. 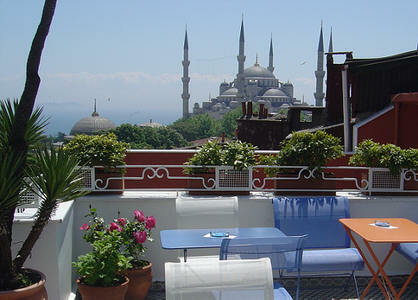 ''...friendly Hotel Nomade Istanbul is a good place for single women travellers...'' Lonely Planet.